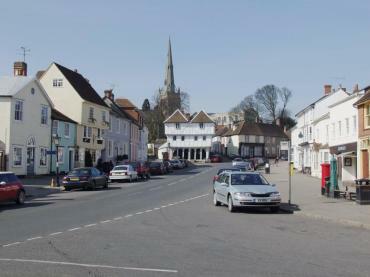 Thaxted is a small market town just 8 miles north-east of Stansted Airport nestling in a valley which it shares with the River Chelmer. The church, with it's impressive tower and spire, is easily visible as is John Webb's windmill to the left. 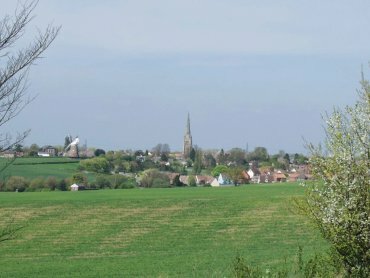 Seen here from the high ground to the south on the road to Great Dunmow. Looking along Town Street the white Guildhall can be seen in the distance with the rather impressive church spire behind. Gustav Holst, the English composer, lived in this street for a while and wrote 'The Planets' suite whilst living in the town. Notice the double jettied, cream coloured, shop building on the left. The lilac coloured house on the far side of the cream building was Holst's home. Another interesting feature is the old green water pump next to the red postbox on the right. 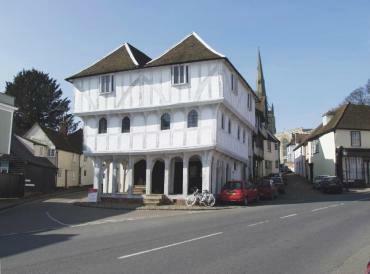 This very impressive building dates from about 1390 and was built for the local Cutlers Guild. It is still in use and has been so for over 600 years. The little street to the right of the building is Stoney Street and leads up to the churchyard. 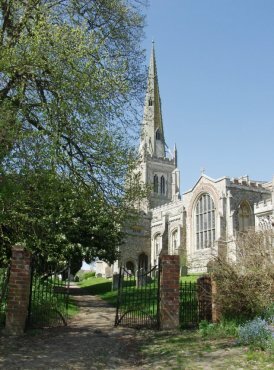 The church of St. John the Baptist, Our Lady & St. Lawrence, Thaxted. This cathedral-like church, 183 feet long, with its 180 foot spire, was built between 1340 and 1510. The church was built in the form of a cathedral, with a crossing between the main body and the chancel and the roof is early 16th century. The pulpit, with canopy, dates from around 1680.